Hi! We are Mike Sundy and Jonathan Sundy, the creators of Pancho Bandito and the Avocado Desperadoes. We're going to talk about the writing and illustration process we went through to create our indie picture book. In the writing section, Mike will cover inspiration, fan dialogue, rough ideas, research, music, outline, manuscript, beta read, and notes. In the art section, Jonathan will cover design, research, storyboards, illustration, and format. Then we'll wrap up with a little bit about iteration and reception. First, let's introduce ourselves. 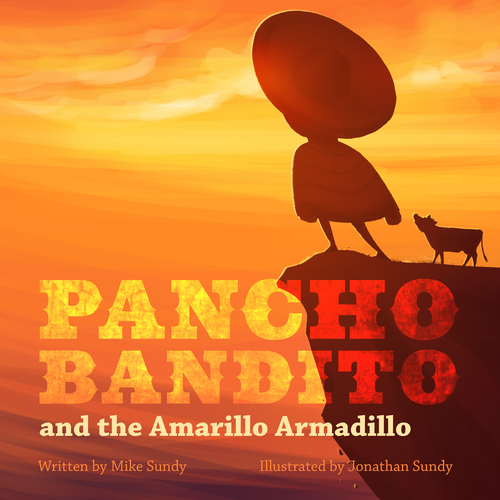 I'm Mike Sundy and I'm the author of the Pancho Bandito series, among other books. Jonathan and I are from a midwestern family of five, where I'm the oldest and he's the youngest. I used to work at Pixar as an IT person and Jonathan used to be the Design Director of Metaphase Design group in St. Louis. We both left our desk jobs a couple years ago to pursue creative lives, Jonathan in art and myself in writing. We've worked together on a few books now and have figured out a process that works for us. We call it "brollaboration." :) So, let's start at the beginning of the brollaborative process: inspiration. Jonathan (R) and Mike (L) during a school visit for the first Pancho Bandito book. Pancho Bandito and the Avocado Desperadoes is the second book in our epic tall tale Western series. The benefit of it being a sequel is that I already have some material to start from. There were loose threads from writing the first book that we wanted to explore, mostly having to do with the backstory of his family. Things are usually fuzzy at this early stage, with no clear path forward. For this one, we came up with the title first because it was fun to say. Then we built a story around it. Another place we got inspiration from was our fans. Jonathan at a school visit in Philadelphia. We did Skype and school visits with fans of our first Pancho book. Some of the kids asked questions that shaped the direction of the second book. Some of these questions we explored were: Why is Pancho so big? What happened to his parents? Where's his weapon? Notes from our first in-person meeting about Pancho 2. A lot of my early stages of writing are jotting things down on Post-it notes and scraps of paper. I'll also record a voice memo on my iPhone if inspiration strikes me while I don't have a pen handy. The fan questions above got me noodling about possible answers. Maybe Pancho's so big because his ancestors were Olmecs. Maybe his parents had something unfortunate happen to them and that's why Pancho grew up alone. Maybe he wasn't always alone, and we could end this book with a revelation about a long-lost family member. I still didn't have a good answer about what Pancho's weapon was or how he got it. That seemed like a good concrete goal that Pancho could have in book two: getting his weapon. I got to research many interesting things for this book: southern California mountain ranges, avocado crop-growing regions, and the giant stone heads and language of the mysterious Olmec civilization. Much of the research doesn't go directly into the manuscript, but it informs the feel and gives it an authenticity which grounds the story. Our villain steals crops and ships them by rail to make his gold. Pancho's heritage is from the mysterious lost Olmec civilization. Gathering Olmec imagery also helps shape the story. Now that I'm ready to get into the official "writing things down" part of the writing process, I choose my playlist. I write to music since it helps me block out the outside world and puts me in the fantasy world of the story. Another bonus is that the music acts as a trigger to get me writing. For Pancho, I wrote to classic country because it was the kind of music I thought a cowboy would listen to. That meant I heard lots of Johnny Cash and Patsy Cline, with a dash of Marty Robbins. The playlist that I put on to when I write Pancho books. Click the image if you want to listen to some old school country. Here's where the "real" writing begins. It's all been theoretical until this point but now I'm starting to construct the narrative. I believe most kidlit writers don't outline, but I usually do. It comes from my background in screenwriting. I like outlining because it gives me a roadmap for the manuscript and lets me work out the story beats in a looser format. I'm not as precious about changing major story beats if I haven't spent the time to craft dialogue and text. That helps me be flexible when I get feedback. I tend to write early drafts long and then cut way down. This is the stage that most people think of as writing. This is when I choose the actual words that will go on the page. I've done a few drafts of the outline at this point. Now it's time to do a few drafts of the manuscript. I get to throw in fun Old West words like "vamoose" and "skedaddle." The manuscript usually starts off way too long and self-indulgent. By the time I get to the third or fourth draft, the text has been trimmed down. It's going to get cut down and reshaped even more in the next stages. I'm lucky enough to have a kid audience that I can test stories on: my three daughters. I read early drafts of the story aloud to them to get their reactions and see where the text feels clunky, confusing, or overlong. For children's books, it's critical to read the story aloud until I get the rhythm right. After I read the draft to them, they give me notes and tell me what parts they liked and which parts they felt could use more work. I get a handful of notes from other writers, but Jonathan's the key person I get notes from. He's a writer himself. We have a true collaboration, where sometimes he invents story things and sometimes I come up with art ideas. Though technically I'm the author and he's the illustrator, we blur those lines and take whatever idea's best for the book. I send every draft to him, and his notes are what give me the fuel to do the next draft. My three legbugs holding the paperback version of Pancho 2. The red ink is from my daughters' feedback on the story. The yellow in-line notes are where Jonathan (aka Jolly) had some feedback on the story. I write in Movie Magic Screenwriter because I can't live without the in-line notes feature. When the manuscript gets to the stage where we're both pretty happy with it, I hand it off to Jonathan for illustrating. I'll still make many text edits throughout the illustration stage, but the bulk of the work now falls on his shoulders. I will now hand off this blog post, so he can speak about the other half of making a kid's book. Chilling in my backyard hammock now that Jonathan has to do all the work. Phew! Is that guy finally finished blathering on about writing? Now we can talk about the fun part - illustrating! Before you can illustrate a single page, I recommend figuring out the overarching design or style of your book illustrations. Do you want a detailed, naturalistic style or cute and simple? The design phase is all about figuring out the visual feel of the world in which your characters live. During the design phase, my main focus is on Character and Environment Design. Pancho Bandito and the Avocado Desperadoes is a sequel, which meant we already had a lot of the visual style figured out and our main characters had been designed. So, most of our focus was designing new characters and environments. Research for our El Pico character. Color and style inspiration for our environment. Research for the train design. When designing a new character, I always start with research. I'll look at similar characters from movies or books, outfit designs, time periods, and locations. The images I gather in research are then used as inspiration when I sketch a bunch of different versions of my characters. I'll share these sketches with Mike and we'll narrow in on the specific design that makes the most sense for the story. I always try to make each character's overall shape unique. Generally, you should be able to identify each of our characters by their silhouette. The main new character in this book was the villainous El Pico. His name means "The Beak" so I knew his large nose would be a focus of the design. This design process - research, sketch, downselect and refine - is the exact same method I use to develop the environment designs. Now that we've solved the major design questions, it's time to storyboard the book. Storyboarding is all about figuring out the image associated with the text on each page. I start by asking questions: What is the major emotional driver on this page? What is the main action in the text? What information is most important to communicate to the reader? Next, I do a really rough sketch for each page. I do these sketches on Post-it notes or fit 10+ sketches on one page. A small canvas keeps me focused on the big picture composition rather than noodling details. I'll often do 3 or 4 super quick variations of each page to figure out which composition works best for the story. A page of quick storyboard sketches. Keep sketches loose, don't focus on details. Mike and I typically do a few drafts of the storyboarded book. We often find that once we have the illustrations, some of the text can be cut. After we settle on a draft of the storyboard that we both like, I'll move on to final illustrations. Storyboard sketches arranged sequentially. I use Powerpoint for this because I'm familiar with the program and it's easy to share PDFs with Mike. This phase is all about creating the final drawings that will be in the book. I illustrate all of my final artwork using Photoshop and a tablet, which enables me to draw directly on my screen. I use the storyboard images as an underlay layer for each page. I'll add more detail, clean up the linework, and add color and texture. Also, I'm always careful to leave enough room for the text that will be on that page. These images take between 6 and 9 hours to create depending on their complexity, which makes illustration the longest step in the entire book creation process. Now that we have the final images, it's time to format the book. By format, I mean combine the text and final artwork on each page and then output a file that can be used for either eBooks or Print. We use the programs/apps Book Creator (iBooks), Kindle Kids Book Creator (Kindle) and Adobe Indesign (printed books) to format our books. For Book Creator, we just drop the images in, add any text, and then export as an ePub file for iBooks. Book Creator is an incredibly intuitive app and lets me do everything from my iPad. InDesign is a more complicated program to pick up but it is very powerful and gives me a lot of design control. Lastly, I wouldn't wish Kindle Kid's Book Creator on my worst enemy, but we haven't found a better app for Kindle children's books. We used the app 'Book Creator' to format the iBooks version of Pancho 2. Things are never perfect the first time. We iterate through multiple drafts in all of the writing and art stages. It's vital to have a collaborator who can tell you when things aren't quite there yet but also supports you and helps you get to a higher level of craft. We challenge and encourage each other through the multiple iterations it takes to create work of high-quality. All those different files are different drafts of the story. It takes many sketches before we find the right design for a character. Featured banner on the front page of the iBooks Kids store. We hit #5 out of all iBooks Kids books. Now that we took you through the creation of the book, how was it received? Very well! We debuted at the top of our Amazon sub-categories and #5 on iBooks Kids. The best part (so far) is that iBooks decided to feature it on a huge banner on the front page of their Kids section, next to kidlit heavyweights like Raina Telgemeier and Dav Pilkey. Actually, I'm lying. The best part is that I get to make cool stuff with my brother. Hope you enjoyed this walk through our process to create Pancho Bandito and the Avocado Desperadoes. If you want to support us and what we do, you can pick up a copy of the book here: Paperback | Kindle | iBooks. Thanks! See Pancho battle bad guys on a speeding train! P.S. We're currently working on Pancho 3! 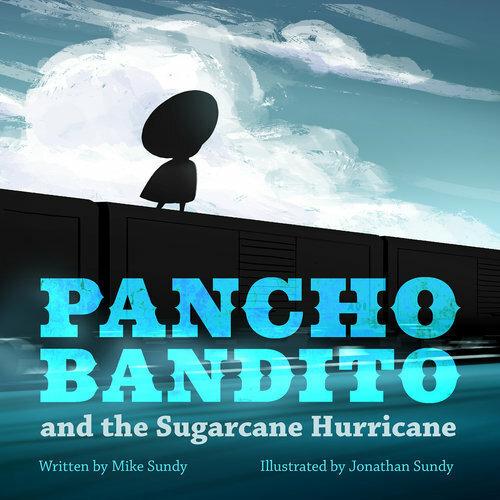 It's called Pancho Bandito and the Sugarcane Hurricane and will be released in Fall 2017. You can pre-order it here on iBooks. Jonathan and I had a wonderful time on the Art of Show podcast with Brandon Cullum. We talk about "brollaboration" in children's books, growing up in a practical family, and our process for creating the Pancho Bandito series together. You can watch the Youtube video or check the podcast out on iTunes. Hi. 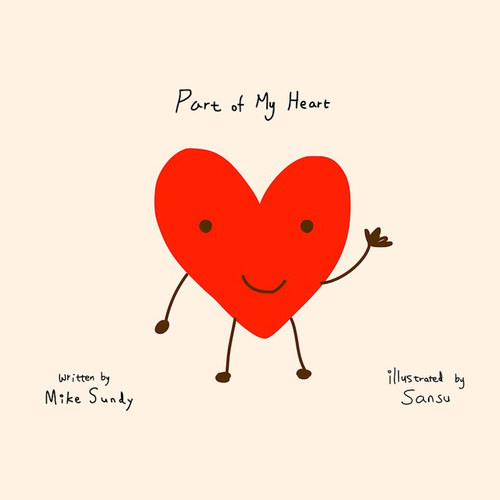 My name's Mike Sundy. I'm an author and the founder of Legbug. Think of this as an orientation post. I'm going to introduce the company and talk a bit about our mission and principles. Then we'll highlight the indie publishing revolution and our goals. Finally, we'll mention the plans for future blog posts. Legbug is a high-quality indie kids' book company started in 2015. We currently focus on picture books and middle-grade novels. You may look at our logo and wonder, "what is a legbug?" It's an elusive creature that can be baited with Cocoa Puffs or Nutella. I have three daughters. When I used to go to a desk job, they would cling to my leg to prevent me from leaving. This sums up why I started this company: to foster a deeper connection between parent and child and to allow me to spend more time with my own kids. The mission of Legbug is to make high-quality indie kids' books that rival traditional publishing standards. I worked at Pixar for over eight years and soaked up their storytelling and cultural principles. Pixar taught me a lot about regularly getting feedback from other creatives and iterating on work till you execute it to the highest standard. I also met many of my world-class illustrators there in children's book classes with Lissa Rovetch. One of my great joys with Legbug is helping phenomenal artists get their work out to the world. We believe that the bulk of the power and money should go to the creators, not to the middle men. Power for creative control and personal vision. Money so that creators can support themselves and their families and have the independence to create more great work. That's why our standard picture book contract is a 50/50 royalty split between author and illustrator. Time to market. When we finish a book, we hit the publish button and it's on over 50 online stores around the globe overnight. When a traditional publisher "finishes" a book, they're usually at least a year away from releasing it. That means we can release more books faster. Full creative control. We tell stories that aren't watered down by marketing departments or gatekeeper biases. Higher royalties. Traditionally published creators typically get a 5-15% royalty on each book sale. We get a 70% royalty by going directly through the distributors. That means we have to sell 5x fewer books to compete with traditional publishers. Virtually zero up-front costs. Due to e-books and free tools, you can create and publish a book for free. The old days of self-publishing required spending thousands of dollars to print physical inventory. Then the creator had to eat that cost if they didn't sell all of their books. In indie publishing, e-books allow for free infinite copies and print-on-demand enables a creator to operate with zero physical inventory. Our long-term goal is to be for children's books what indie icons like Hugh Howey and Image Comics are for sci-fi and comics, respectively. There are already some huge self-publishing success stories and it's even starting to happen in children's books. This whole operation is an experiment in progress. The indie publishing revolution may not disintermediate children's books the same way it has other genres. We may fail spectacularly. I'm okay with that, as I'm a strong believer in failure. The only way to forge a new path is to try, stumble, and try again till you get it right. This blog will document our journey as we attempt to prove a new indie kids' book model. Follow along to see if we succeed or crash and burn. Additional blog posts will introduce you to our creators and take you behind-the-scenes for the in-depth creative process of making our best-selling books. Subscribe to our mailing list below to get notified when new posts come out. And click the Share button to share with any friends who may be interested in following along on our journey. Thank you.